Carson Wentz passes to Wendell Smallwood on the Eagles’ game-winning drive. It was the possession when yards stood still. On the Eagles' first seven plays of their game-winning drive, they netted zero yards. It was a 17-play, 11-minute-plus fourth-quarter-behemoth. Twenty-one plays, if you include the penalties. "They don't count officially," Eagles guard Stefen Wisniewski said. "They count on my body." It was a mess of a drive for both the Colts and Eagles. The Colts had four penalties, one of which was declined. The Eagles had four negative-yard plays. But Carson Wentz, upon his return following a 9½-month hiatus, would not let his offense leave the field. 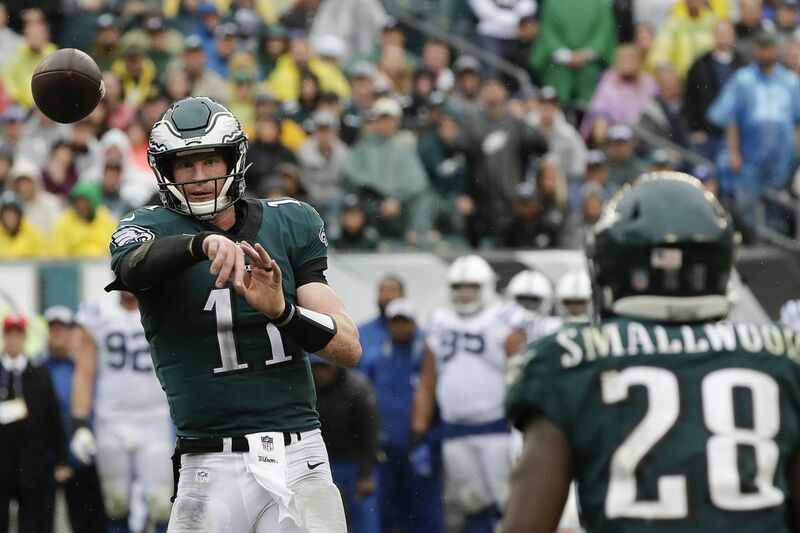 For 11 minutes and 18 seconds, the quarterback methodically worked the Eagles down the field in a drive that culminated with Wendell Smallwood's 4-yard touchdown run in a 20-16 win Sunday. Wentz wasn't perfect. His first game back showed some rust. But he looked his 2017 self often enough, and on the game-winning scourge he did Carson Wentz things with his arm, legs, mind, and voice. Confronted with second-and-26 early in the possession after a holding penalty, the Eagles quarterback spoke up as the official walked the ball back to the 20-yard line, 5 yards behind the original line of scrimmage. "I just told the guys, 'Let's get half of this. Let's get at least half of this. Get us in third-and-manageable. Just stay together,' " Wentz said. Wentz threw to tight end Zach Ertz short of the first-down marker, but Colts cornerback Nate Hairston was called for holding. The 5-yard penalty moved the Eagles back to their starting point, but it was an automatic first down and gave the offense new life. There would be other setbacks: a sack, a tackle for loss. But the Eagles survived on a day when workmanlike drives, rather than quick strikes, would have to suffice with the offense shorthanded. "It goes without saying, you'd love to score five-play drives and put yourself in the end zone," Eagles coach Doug Pederson said, "but sometimes it doesn't happen that way." Running back Wendell Smallwood crashes over the goal line in the fourth quarter to give the Eagles the lead. Winning is, ultimately, all that matters. But this isn't last season's offense – at least not yet. Personnel is different in some areas, but receiver Alshon Jeffery's absence and injuries to receiver Mike Wallace and running backs Jay Ajayi and Darren Sproles have forced Pederson to make due. The Eagles had scoring drives of 12, 11, 13 and 17 plays, although a 2-for-4 red-zone ratio brought about some hand-wringing. But when they needed to punch into the end zone, they did with 3:02 left on the clock. "Those are the types of drives you need in games like this," Eagles center Jason Kelce said. "A lot of things weren't going our way." For instance, on the first play of the drive, running back Corey Clement was dropped for a 3-yard loss. The Colts had just taken a 16-13 lead early in the fourth quarter and the Eagles were already behind the sticks. But Wentz hit rookie tight end Dallas Goedert for 8 yards, and on third-and-5 he found receiver Nelson Agholor on a shallow cross for 6 yards. But Wentz was sacked on the next play and a Clement 20-yard burst was brought back by receiver Kamar Aiken's hold. Wentz wouldn't let his teammates get down. "It was just a message of positivity," Ertz said. "Like don't worry, don't get too anxious about it. Just go out there and do your job." Ertz drew the hold on the next play and the Eagles gained 35 yards on the next five plays, including a penalty, to advance to the Colts 40. But Wentz was sacked again on second down. A short third-down pass to receiver Jordan Matthews left the Eagles in fourth-and-5 with 6:24 left. Pederson gambled, per usual. Wentz was pressured and threw short of Matthews, but Colts defensive end Jabaal Sheard was flagged for holding tackle Lane Johnson, who visibly threw his hands into the air. "I don't know if it was acting," Kelce said, "as much he was really trying to get off." Nevertheless, the Eagles were resuscitated again. Of course, they would lose 8 yards on the next play when the Colts snuffed out a screen to Smallwood. But the running back picked up half the yards after a short pass, and on third-and-9, Wentz eluded rushers and found Agholor on another crosser. "Nelson just always has a feel and being in the right spot," Wentz said. Agholor turned just short of the sideline and dived beyond the marker. On the game broadcast, close-up shots of his foot made it look as if he had stepped out of the bounds, but the Colts didn't challenge. "If that was the case, which I don't think, I appreciate that I got away with one," Agholor said. Clement gobbled up 14 yards on the ground running behind left tackle Jason Peters on the next play. Three plays later, the resurrected Smallwood took the handoff and jetted into the end zone. "I felt like that was one of the easiest touchdowns I've had," Smallwood said. Wentz called the inside dive in the huddle, which ended up being ideal against the Colts' two deep safeties. Peters cleared out the middle and Ertz jumped to the second level to take out the linebacker. "It really doesn't have a designed place to hit," Kelce said. "It's just kind of wherever the movement is generated if they got out of position." The Eagles had an 18-play drive against the Giants last season but that one lasted only 9:34. Their longest-documented previous drive in terms of time consumed since 1999 – as far as records date back – was a 10:13 efforts against the Seahawks in 2011. But the Eagles lost that game. Their will on this day would not be denied. "We were all tired, for sure. Luckily they were fairly tired, as well," Wisniewski said of the Colts. "That was a grind."